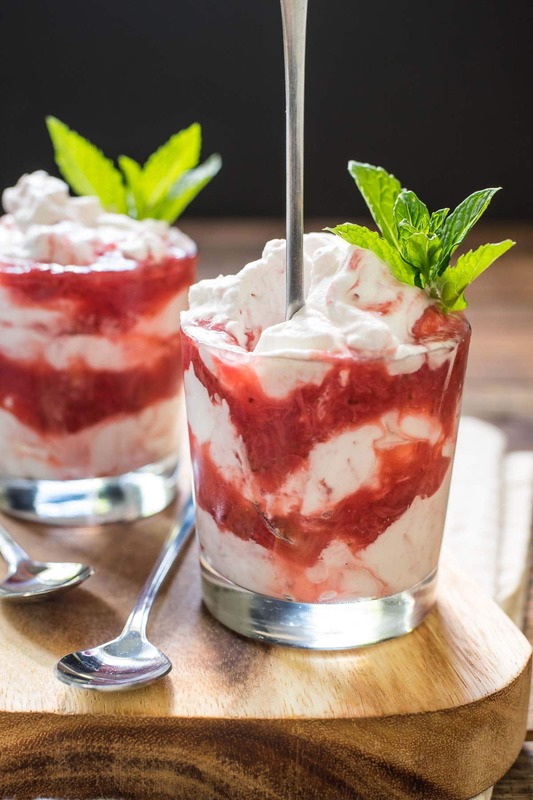 This Strawberry Rhubarb Fool is a classic no bake dessert that’s light, airy, and perfect for summer gatherings. For as mild a winter as we had, summer really took it’s sweet time showing up around these parts. In mid May we had highs in the 50s and dreary, drizzly days. But last week the sun finally decided to show up, and it has lifted my spirits so much. I didn’t even realize how much my soul needed the bright colors and warmth of spring until I found myself nearly in tears at the park, overwhelmed and filled by the beauty around me. If you’re in Columbus, you really must make it over to Franklin Park. It is a wonder this time of year, with grape vines winding up arbors, fields dotted with delicate lilacs, and lines of purple cabbage heads interspersed with sprigs of dill and chives. I really am so thankful we live in a city with so many wonderful outdoor spaces. As much as I love my right-next-door neighbors and busy streets, this country girl needs some wide open spaces and a straight view of the sky from time to time. 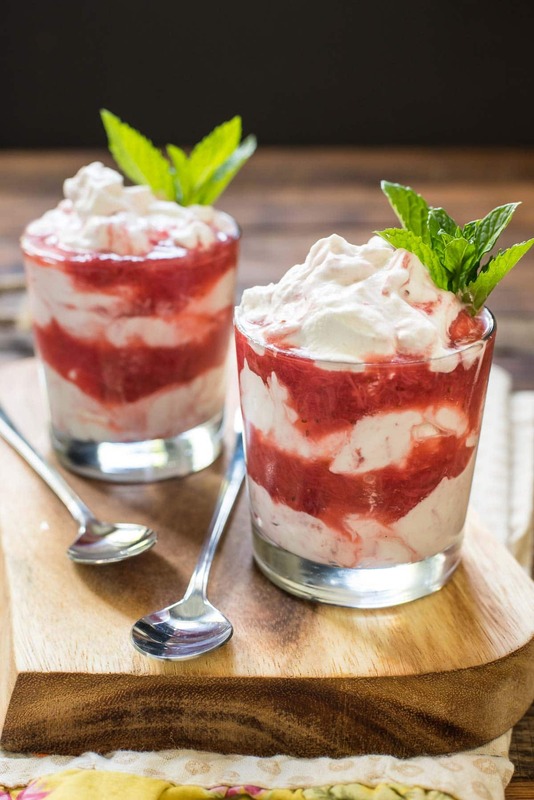 The sunshine and warmer temperatures have had me craving equally light, bright, and breezy desserts, and this Strawberry Rhubarb Fool fits the bill in every measure. As far as work to reward ratio goes, it doesn’t get much better than a fool. I’m not exactly sure how the fool got its name, but I’m going to assume it’s because it’s so simple even a fool could make it. 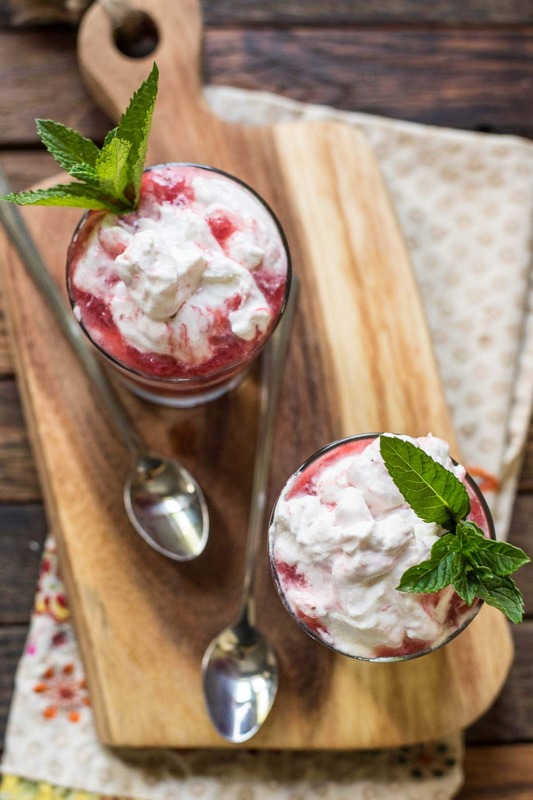 This classic dessert is made by stirring pureed fruit into fresh whipped cream. I’ve made it with strawberries and raspberries in the past, but I have to say, this Strawberry Rhubarb version is definitely my favorite. Rhubarb plays so well with strawberries, highlighting their sweetness and bringing its own subtle, earthy tang to the mix. I cook the two together with a little sugar and orange peel for a simple compote. After chilling, this mixture gets gently folded into pillows of whipped cream and layered in parfait cups for the perfect summer dessert. Most fools call for all of the fruit mixture to be stirred into the whipped cream, but I prefer to layer some of the compote in the glasses so you have pockets of sweet tangy fruit to contrast the smooth, rich cream. If you could eat clouds, this is what they would taste like. Not too sweet and light as air, this is the kind of dessert you can serve at a fancy summer get together or a casual backyard BBQ. It’s deceptively easy and beautiful, and requires very little work for a large amount of joy and satisfaction. If you love the tang of rhubarb, you’ll also want to try my Rhubarb Custard Cake and Rhubarb Upside Down Cake! In a small sauce pan, stir together the rhubarb, strawberries, sugar, orange peel, and water. Cook at a simmer for 10 minutes, stirring occasionally, until rhubarb is softened. 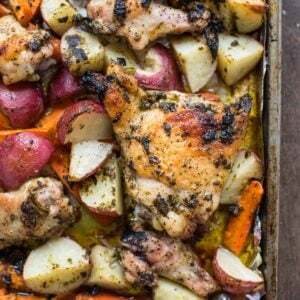 Allow to cool then refrigerate for at least two hours. 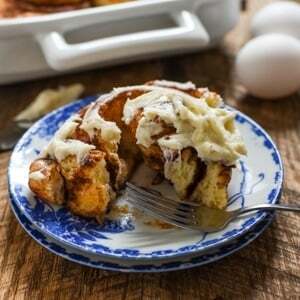 Add the whipping cream and powdered sugar to the bowl of an electric mixer fitted with the whisk attachment. Beat at medium high speed until the cream begins to fluff and forms soft peaks. Stir in vanilla. Refrigerate the cream until ready to serve. For serving, gently fold 1/2 the strawberry rhubarb mixture into the whipped cream, so ribbons of fruit still remain throughout. Spoon the cream into serving glasses, alternating with the remaining fruit mixture. Serve immediately. Note: This post contains an Amazon affiliate link. If you click the link and make a purchase, a small percentage will come back to support the ongoing maintenance of NeighborFood. Thank you for your support! I love the strawberry rhubarb combo! One of my seasonal favorites! This looks like the perfect summer dessert. Love the mint garnish too!